Are you looking for an edge to help you engage your audiences? . . . something to make your communications more memorable and lasting? David brings a fresh approach to stakeholder engagement by weaving theatre and play into proven engagement processes. Using your content as the skeleton, he creates interactive performances, workshops or simple activities that are fun, engaging and educative. The aim is to give people an embodied experience in a supportive environment that can also build team rapport. These experiences are often remembered for years to come. Making your engagement more fun, educational and memorable . . Team building workshops - shared play, connection and adventure that is tailored to the culture of your team. Collaborative artwork - designing and creating a temporary or permanent art work that has meaning for the group. 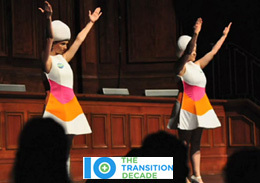 Fun participatory events - Fun ways for people to express their creativity at conferences, retreats or one-off events: variety night, trivia quiz, talk show, comedy cabaret, costume fashion parades, etc. Leadership Training - making it fun to engage with Leadership content and find experiential ways to embody the learnings. Professional Development - layering fresh comedy, games and interactivity to enable deeper immersion in the learning content. Experiential tours - comedy site tours to get out in the field and have fun while learning. Videos - using customised characters to convey messages. Employee engagement - finding novel ways to communicate information with your audience, or to receive their response to a proposal. Market Research & Stakeholder engagement - using theatre and characters to attract, engage with and listen to stakeholder's feedback. Internal Communications - creating stronger cut-through of your messages. Conflict resolution - using theatre and role-play to make light of conflict while respecting the issues at hand. Allowing unexpected solutions to emerge from the process. 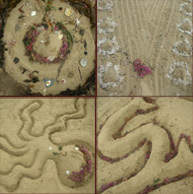 Sand sculptures made by small groups at Somers beach. 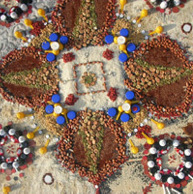 Mandala made out of recycled garbage. Have a project in mind that could do with a creative edge? Call David now on 0422 406 809 to discuss ideas.